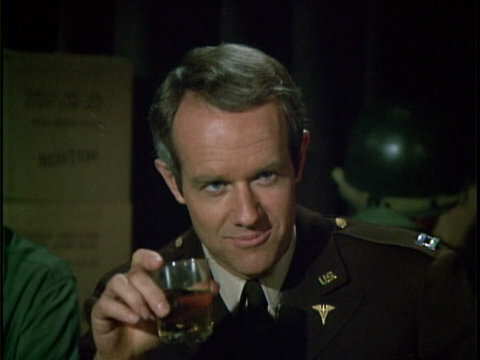 Capsule Summary: While trying to catch Trapper at the Kimpo Air Base, Hawkeye meets the 4077th’s new surgeon–B.J. Hunnicutt. Meanwhile, Frank is in command and loving every minute of it. I honestly don’t have much to say about “Welcome to Korea,” at least not about the storylines and plot. The episode had one big goal, to introduce the character of B.J. Hunnicutt, and it did a decent job. Watching the episode, it’s clear that B.J. won’t be a clone of Trapper. He’s a family man and seemingly a nice guy who clearly doesn’t know what to expect in Korea. His first few hours in country are a trial by fire: he watches locals risk their lives to clear a minefield, comes under fire from guerillas, gets shelled, and sadly sees death and destruction up close. As if that isn’t bad enough, he slips in the mud. Poor Hawkeye. He’s shocked when he learns that Trapper has gone home gone. Even worse is his distress when he misses saying goodbye to his friend by ten lousy minutes. Frank finding Trapper’s robe and hat in the Swamp is a nice touch. So is the brief mention of Colonel Blake in the Kimpo Officers’ Club. “Henry was okay, from the navel out in every direction,” Hawkeye tells B.J. “He sure was,” Radar says.” Notice the look on Radar’s face. He’s still devastated. Does anyone else feel even a little bit sorry for Frank, knowing his days in command are numbered? In earlier episodes, his brief stints as CO didn’t go well for the rest of the camp and judging from his actions in “Welcome to Korea,” he had no intention of easing up on rules and regulations. Margaret seemed to be doing more of the work than Frank. -Is Trapper running “naked through the Mess Tent with no clothes on” a reference to Hawkeye walking through the Mess Tent naked in “Dear Dad, Again” during Season 1? -Klinger flipping through one of Hawkeye’s nudist magazines (“I wonder what a naked girl sounds like on the phone.”) and then stuffing it under his shirt is amusing. -Frank’s voiceover about the United Nations seems out-of-place. -Is it just me or does the blood on the wounded soldier Hawkeye and B.J. treats look incredibly bright and fake? Welcome to Korea, B.J. Hunnicutt. This was the first hour-long episode of M*A*S*H. It was produced as two half-hour episodes (with production numbers G504 and G506). CBS repeated the episode in its original hour-long form but when the series went into syndication, it was aired in two parts. With Stevenson definitely gone at the end of season 3, plotting began on what would have been the first episode of Season 4 – “Change of Command.” The work was done during the hiatus between (seasons) 3 and 4. During that period, we sweated out the Rogers situation – would he leave the show, wouldn’t he, etc. When it became clear that he was leaving, we began casting for another actor and preparing the script for “Welcome to Korea,” without a whole lot of time to get it ready. In other words, had Rogers not left the series, Season 4 would’ve opened with “Change of Command” and the arrival of Colonel Potter. No. Wayne was long gone when we recorded that PA announcement. However, in January 2016 Ken Levine was asked the same question at his blog. According to him, Wayne Rogers did provide the voice, uncredited. I’m still not convinced. Rogers was in the middle of a contract dispute at the time. Why would he agree to record a PA announcement? Plus, Larry Gelbart said it wasn’t Rogers. -When Hawkeye and Radar are driving to Kimpo, time compression was utilized. “It was the only way we could make it seem as though our clunky old jeep could appear to be going swiftly,” Gelbart explained [July 1998]. -Pete Rugolo was brought in to compose most of the music for this episode, including the jazzy version of “Suicide is Painless” used during the “roll call” montage. The score was meant to reproduce the sound of the big bang era. “It was a giant effort and I feel he brought it off brilliantly,” said Gelbart [January 2000]. -The scene in which Hawkeye, B.J., and Radar steal the jeep and drive off at Kimpo was shot at the Fox Ranch. 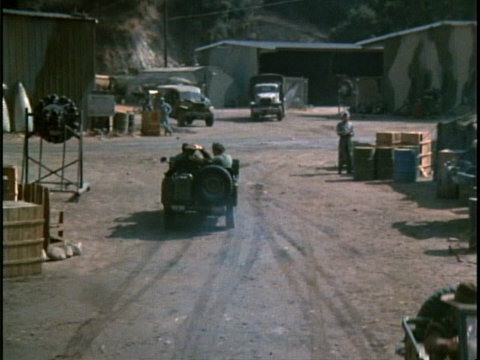 The same location was used in the movie MASH [December 2004]. 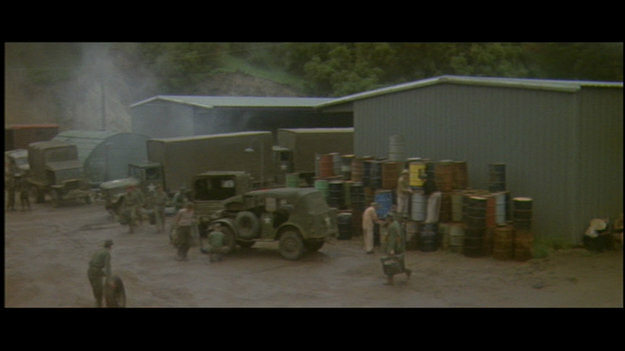 Kimpo Air Base as seen in MASH the movie. A quick shot of B.J. running toward a helicopter is added to the opening credits in place of Trapper. The same shot is also used in several other episodes before being replaced by a close-up of B.J. Also, the final shot of the jeeps transporting wounded has been cropped to cut out Trapper in the top jeep. Starting with Season 4, Jamie Farr’s name was added to the opening credits. The “roll call” near the end of the episode prior to the brief scene with Colonel Potter was the fourth and last time that particular device was used on M*A*S*H. Similar roll calls were used in “M*A*S*H–The Pilot,” “Dear Dad,” (both Season 1), and “Divided We Stand” (Season 2). This is one of my favorite episodes – a brilliant way to quickly introduce the viewers to a brand new character as well as explain why another character left. Although, I STILL wish Trapper and Hawkeye would’ve been able to properly say goodbye to each other…. But, I guess that probably would’ve been it’s own episode. But, I didn’t know that they had to quickly write this episode… Just another display of the talent in front and behind the camera. Now, one thing I’ve always wondered…. Was BJ’s fall/slip in the mud planned? Or was it Mike Farrell accidentally falling and they decided to keep it in the show? I know the creators of the show did not permit improvising. I like when TV shows and movies decide to keep items that were not a part of the script. Another great write-up of another great episode. Thanks RJ! While I immensely enjoy this episode now, I remember it threw me off the first time I saw it almost twelve years ago: I was already stunned by Henry’s death, so I wasn’t prepared to discovered that Trapper had left as well, so as such, and since it was handled in sort of a haphazard way, I took me a while to warm up to B.J., but I eventually did. To this day, I still believe that completely replacing Trapper with a different character was the wise thing to do: had M*A*S*H been another standard sitcom from the 60s, Trapper would have either been completely recast, or a very similar character would have been brought in instead, and it wouldn’t have worked. I remember in a documentary that Burt Metcalfe said when replacing one character, they had to make sure that the new character differed significantly from their predecessor, while still be appealing – M*A*S*H did it well with all of their replacements: faithful B.J. compared to promiscuous Trapper, efficient Potter compared to bumbling Henry, and gifted Charles compared to incompetent Frank. I know some fans consider “Welcome to Korea” to be a “road trip” episode, and I guess most things considered, it makes sense. I don’t find Frank’s comments about the U.N. out-of-place at all: he mentioned his disdain for the U.N. on other occasions, and it seems to be a common thing among the Republican party (which Frank clearly was). During the 1973-74 TV season, M*A*S*H actually had a sister show called ROLL OUT!, starring Stu Gilliam and Hilly Hicks are drivers for a supply unit in France during WW2 – CBS had pretty much commissioned Larry Gelbart and Gene Reynolds to make the show for them to try to bank on M*A*S*H’s newfound success, but because of that, ROLL OUT! failed and barely last half a season . . . from what very little I’ve seen (such as the main titles on YouTube), it appears the set used for Kimpo Air Base was actually used as the main camp compound for ROLL OUT! The one minor thing that sticks out for me in this episode was when Radar runs out to save the farm girl that was hit by the land mine, B.J. yells at him by his last name . . . do you think they were initially going to try to make B.J. a little more military than Trapper was? Other than that, as I’ve said, I really enjoy this episode now, but at the time, I didn’t so much. There were very few things about the series and decisions made by writers and producers that I wasn’t okay with but this episode includes one of them. I love this episode, but it still bugs me to this day that Trapper never left a note. I’m fine with the fact that they didn’t have a face to face goodbye. The guys said what needed to be said and Trapper had a goodbye party in the episode “Checkup.” Not leaving a note just seemed out of character for Trapper, and I always felt like the reason was because of sour grapes on the part of the producers because of the way Wayne Rogers left. Just wondering if this bugged anyone else as much as me. A very funny episode in what must have been a chaotic production environment for the producers, writers, and actors. One of my favorite M*A*S*H lines of dialog is in this episode after Radar orders his Grape Nehi in the Officer’s Club. “We don’t use straws in combat, fella” — still cracks me up every time. Also don’t have much to say about this episode except that all it does is serve to remind me that M*A*S*H was irrevocably changed. Trapper and Blake are two of the best tv characters ever, and definitely the best two M*A*S*H characters (IMO) and the show was never even close to the same after their departure. This is one of my favorite episodes! 🙂 The transition between Trapper and B.J. is sad, and was hard for me to watch at first, especially after Henry’s death. However, I think that the writers did a really good job considering that Wayne Rogers left between seasons. B.J. is one of my favorite characters, and this episode does a good job of showing that he’s a little more serious than Trapper but still knows how to have fun. I think my favorite quote from the episode is “What Say Ya, Ferret Face?”. 🙂 And yes, the announcement at Kimpo does sound a lot like Wayne Rogers (even if it’s not him). one thing about this episode that I’ve always wondered-did they get the idea of having Hawkeye steal the jeep from the airfield; from the scene in the movie where he also does it? Most likely that is it. Several early season ideas came from the movie or book. I haven’t seen the movie in years, but doesn’t Duvall’s Burns get hauled away in a jeep? In this episode, Frank is arrested and taken away in the stolen jeep. A borrowed idea also, maybe? Also, is Linville’s Burns going nuts at the beginning of season 6 a nod to the movie? By the way, in the TV series, who was in charge of the 4077th while Frank was arrested? And how was his plight resolved so quickly? When did Eisenhower say he would go to Korea? Notice when Assembly is called, it’s bright and sunny even though Frank says it’s 0516 in military time. A good start to a new era for the 4077th. I believe Frank’s indictment of the U.N. was typical Burns. Seeing “Burnslihan” getting gushy over BJ’s file made me uneasy as well Margaret overruling Frank’s idea of forging MacArthur’s signature on a picture of “Dugout Doug”. Frank would make another comment about the UN to some Koreans that he was trying to teach English: “Get us out of the UN!” It was definitely in character for the xenophobic Frank. BJ would prove to be an interesting contrast to Trapper-a dedicated family man who would only fall off the marriage wagon once, but who had his own nonconformist side that made him such a good fit with Hawkeye, while in some ways being more responsible and mature than Trapper was. Overall a good way to set the change of tone for the post Blake and Trapper era. In this episode Hawkeye mentions Radar having an earthworm farm. A recent rerun of “Match Game ’75” mentioned panelest Gary Burgoff having a side earthworm business in real life. Was the wounded soldier in the mortar attack scene a very young C. Thomas Howell? I doubt it. He would have been about 9 years old at the time. Does anyone know what BJ’S “Goldman-Hawkins” reference is in this quote? I can’t seem to figure this out. Capt. Benjamin Franklin “Hawkeye” Pierce: That’s a new directive from the Pentagon. That’s right out of G2 and G3 making a G5 Combined Officers Op-Tech Glitch. We’re experimenting with a new rank: Corporal-Captain. We’re down here taking a survey, to see, uh, you know, if everybody likes it, uh, asking everybody in Seoul. Capt. B.J. Hunnicut: Goldman-Hawkins, right? Capt. Benjamin Franklin “Hawkeye” Pierce: Right. Colonel: Well, I don’t like it. I don’t like it at all! I think he says Coleman Hawkins, who was a jazz musician. Obscure word play, I guess. I never knew what it meant either. Ok, there is a goof in this episode that my wife points out every time this is on. Radar says that he left his bubble gum in the other jeep, but then chews a Chiclet later on. I told her that one is bubble gum and one isn’t. She says gum is gum. I don’t think it’s a goof myself, but interesting nonetheless. Toward the beginning, when Radar plays the bugle as Hawkeye enters the showers after returning from R&R, it sounds like he plays “Shave and a Haircut” at the end of his bugle call. Also, when Frank Burns berates Klinger for wearing a ladies hat to roll call, Klinger responds, “It’s spring, sir.” Yet we know this episode occurs in September, since Col. Potter arrives soon afterward and the date given for his arrival is Sept. 19, 1952. That’s late summer in the Northern Hemisphere (where Korea is located). One thing I never understood since I first saw this episode as a child: why did B.J. vomit when he saw the dead soldier? I understand that it was likely mangled by the explosion but he’s a surgeon and so should be used to human anatomy and even some gore. Maybe I’m missing something; maybe I don’t understand since I’m not a doctor, but I’ve long wondered about that. The dates/timeframes were always just flat around wrong in the show. I suspect they just stopped trying to have it make sense since they were working on a show that was many years longer than the war itself. Having Potter arrive on that date makes little since, since the war ended less than a year after that, and there’s no way Seasons 4-11 were just a single year. That would also mean seasons 1-3 were over 2 years of the war, which I guess is actually possible. As for BJ throwing up, despite being a surgeon, I suspect it was extremely difficult and shocking for him to see a body mangled so badly, purposely, by another person basically. I’ve seen interviews with doctors after things like the school shootings where they are clearly very bothered by what they saw, despite probably seeing similar on a daily basis. The violence and senseless destruction by other human beings as Hawkeye would put it. Just watched this episode on True Entertainment (UK). They’re showing two episodes, Monday to Friday and I try never to miss it. Crazy really, I could watch all episodes either on DVD or streamed… without adverts or the laughter track, but watching it on TV gives it an authenticity somehow? I find it difficult to believe how fantastic MASH still is, the dialogue sharp, incisive, funny, and very often poignant. There was nothing comparable being produced here in the UK. I was twelve years old when it was first aired and it moved me then and still does now. Anarchic and at the same time bittersweet. Beautiful. As for the scene where BJ is being sick, his reaction has nothing to do with seeing a dead soldier but the fear of being exposed in a battleground, bullets flying, mortars exploding, bodies dropping. The whole episode is BJ’s baptism of fire and at the same time reintroduced the viewer to the horrors of war.